Puggles are one of the most popular hybrid dogs, sometimes called Designer Dogs, in the United States. By some accounts they make up about half of all of the mixed breed population. This, of course, refers to the results of breeding two pure bred dogs and not the typical every day breed of dog that is so common in this country. According the Hybrid Dog proponents, by mixing two breeds of dogs you can bring out the best characteristics of each. Puggles will bring out the best characteristics of the Pug and the Beagle. If you have explored this website at all you know where we stand on the Pug. They are adorable. Additionally they are very intelligent and very sociable dogs who offer great companionship. They are eager to please their owner at all times. The Beagle, on the other hand, are generally considered to be of only average intelligence and can be prone to obedience problems. Still, it is a very handsome dog and a very popular breed. The thinking is that when you mix the two breeds you get a dog that is slightly larger than a Pug and easier to train than your typical Beagle. Does it work? There are many proud Puggle owners who would say that it does. Puggles are a very popular hybrid dog. According to the American Canine Hybrid Club more than fifty percent of their registrations are for this breed. The popularity may be due to some of the high profile owners like Sylvester Stallone, James Gandolfini and Julianne Moore. We think their popularity is due to the influence of the Pug! 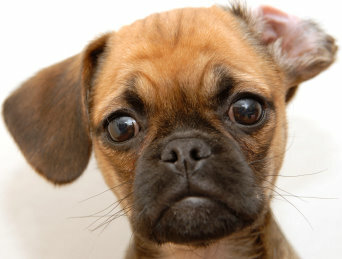 Another hybrid dog is the Chug which is a mixture of the Pug and the Chihuahua. Here, you end up with a dog that weighs about 18 pounds and, like both of their parent breeds, would be very intelligent and very sociable. They are easy to train as well. Neither the Chug or the Puggle would be recommended for allergy sufferers because, even as the product of cross breeding, they still will shed a great deal. That, we think, is the only serious flaw in the Pug. No matter what you do they are going to shed a lot. It is interesting that shedding is also a problem for the Puggle and the Chug. Puggles have most of the characteristics of the Pug Breed. Here is a sample of some of the hybrid dog varieties that have the Pug as a parent. The above information is taken from an excellent book on hybrid dogs called Dogs by Design by Ilene Hochberg. It is a guide on finding the right breed for you.